Who gave me all these children? Isa 49:21 Then shalt thou say in thine heart, Who hath begotten me these, seeing I have lost my children, and am desolate, a captive, and removing to and fro? and who hath brought up these? Behold, I was left alone; these, where had they been? 1)Isa 49:21 Y dirás en tu corazón: ‘¿Quién me ha dado éstos? Pues yo había sido privada de mis hijos, Y era estéril, desterrada y errante. Y a éstos, ¿quién los ha criado? Yo había sido dejada sola; Y éstos, ¿dónde estaban? '” NBLH 2)Isa 49:21 Et tu diras en ton coeur: Qui me les a engendrés? Car j’étais sans enfants, j’étais stérile. J’étais exilée, répudiée: qui les a élevés? J’étais restée seule: ceux-ci, où étaient-ils? FLS 3)Isa 49:21 En gij zult zeggen in uw hart: Wie heeft mij dezen gegenereerd, aangezien ik van kinderen beroofd en eenzaam was? Ik was in de gevangenis gegaan, en weggeweken; wie heeft mij dan dezen opgevoed? Ziet, ik was alleen overgelaten, waar waren dezen? I was sad for the children I lost, but my new little ones say, ‘This place is too small for all of us! I was sad and lonely. My children were taken away. So who gave me these children? I was the only one left. Where did all these come from? “I will wave my hand to the nations. I will raise my flag for everyone to see. Then they will bring your children to you. and they will hold them in their arms. Kings will be their teachers. The daughters of kings will care for them. The kings and their daughters will bow down to you. They will kiss the dirt at your feet. All my trust is in you. Thank you for using me for your Mission, LORD. Thank you for raising ALL the little ones you gave me. And lift them up to you. And when my body returns to dust. Have your way in their hearts. Bless them and increase them. I pray, In Jesus Name. 3. ↑ Isa 49:21 En gij zult zeggen in uw hart: Wie heeft mij dezen gegenereerd, aangezien ik van kinderen beroofd en eenzaam was? Ik was in de gevangenis gegaan, en weggeweken; wie heeft mij dan dezen opgevoed? Ziet, ik was alleen overgelaten, waar waren dezen? Posted on July 12, 2015 November 12, 2016 Categories Born From The Spirit, Isaiah 49, Pray, TeachingTags Commandment, Disciple, Fruit, God, Thanks31 Comments on Who gave me all these children? In The Beginning, Jesus Was The Word And Was God. 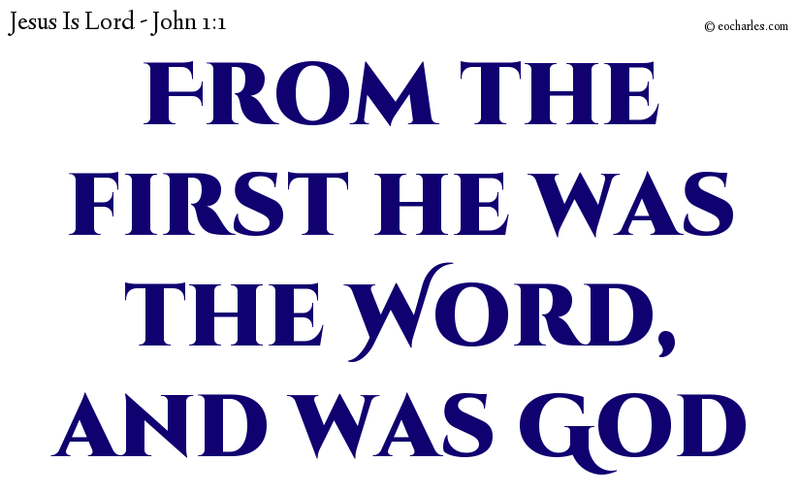 Continue reading In The Beginning, Jesus Was The Word And Was God. Life for ever, the blessing of the Lord upon all his children. As the dew of Hermon, and as the dew that descended upon the mountains of Zion: for there the LORD commanded the blessing, even life for evermore. Continue reading Life for ever, the blessing of the Lord upon all his children. Gen 49:2 Gather yourselves together, and hear, ye sons of Jacob; and hearken unto Israel your father. Come together, you sons of man, and listen to the son of God. I pray that Christ will live in your hearts because of your faith. I pray that your life will be strong in love and be built on love. And I pray that you and all God’s holy people will have the power to understand the greatness of Christ’s love–how wide, how long, how high, and how deep that love is. Christ’s love is greater than anyone can ever know, but I pray that you will be able to know that love. Then you can be filled with everything God has for you. Father, I thank you for Jack. I thank you for changing his rebel heart. I thank you for removing the fog from his eyes, so he could see a way out. We worship and praise you now and forever, In Jesus name. Amen. Dear God, We Thank you for Amelie M.
That hard worker of yours, so industrious, fulfill in her your will to have her be that gracious good wife, whose husband calls her virtuous. And let all the glory be to God. We pray for her in Jesus name, Amen.